The device that set off such a furore on this blog about The Death of Publishers and also resulted in a feature in the Bookseller has finally arrived in my hands. 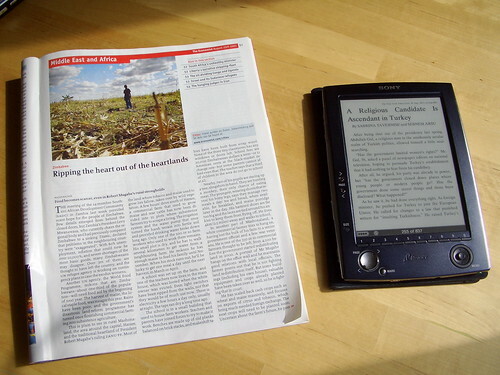 While I’ve only been using it for a week, I think it would be useful to share some first impressions of the Sony Reader – after all, if it’s supposed to herald the downfall of an industry, there’s no time to lose! 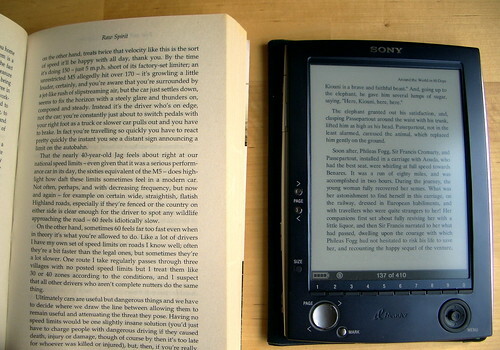 The first thing you notice about the Sony Reader is that it’s unexpectedly small. I’d seen photos of it, and I was imagining something around the size of a hardback, what with the screen that dominates the device, but the Reader is actually shorter than a standard paperback, and a lot thinner. I suspect that one of Sony’s design priorities was making it smaller than a normal book. In fact, when you close the ‘cover’ of the Reader, it becomes even more svelte and diminutive, more like a Moleskine notebook than an actual novel. This is a device that won’t embarrass you if you read it on the tube, and it’ll fit into practically any bag. So far, so good. Can the Reader measure up to real ink? No. The contrast on the Reader’s E-Ink display is just not comparable to any book; it’s more like dark grey on light grey than black and white. It’s harder to read in low light, and if you have poor eyesight, it probably won’t be very comfortable. Despite this, it’s still perfectly acceptable for most people. I’ve shown the Reader to a few friends and they’ve all declared that it looks fine to them. The issue isn’t that text on the Reader is bad – it’s that real ink is basically perfect. Real ink also doesn’t take two seconds to appear when you turn a page. This is not as irritating as it might seem, as you become used to the lag quickly, but it’s not desirable and it’s certainly something that’s being improved in other readers. You’ll notice that in all of these photos, it’s perfectly possible to read what’s on the screen. This is not due to some camera or Photoshop trickery – it’s what it really looks like. A lot of people think that it’ll be more difficult to use the Reader when it’s very sunny; this is probably because if you look at your phone or laptop monitor in direct sunlight, you’ll either see a blinding reflection or a very dim screen. Traditional LCD screens like these tend to be transmissive; they rely on a backlight that provides for very good viewing indoors or in shade (which is where most people use them), but poor visibility in the sunlight. All dedicated eBook readers use reflective displays; they don’t use a backlight, and instead rely on ambient light to illuminate the text. In a way, paper books are simply eBooks readers whose display is broken; with both, you need at least some light to read from. I wouldn’t be surprised, though, if future eBook readers had built-in illumination. At this point, I should cover a rather important point that many people ignore. 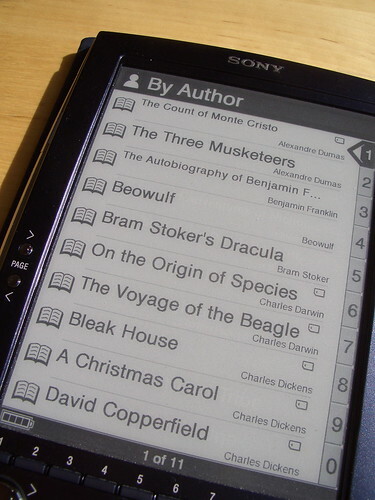 The Sony Reader doesn’t come filled with a huge library of books. Andrew Marr’s Iliad Reader might have come with dozens of free books, but don’t think for one second that that applies to the rest of us, unless you count a bunch of bestseller excerpts and a Star Trek novel as being on equal footing with Dickens and George Eliot. If you want to add or remove books, you need to connect the Reader to a Windows PC (it doesn’t support Macs*) and run the Connect Reader software. 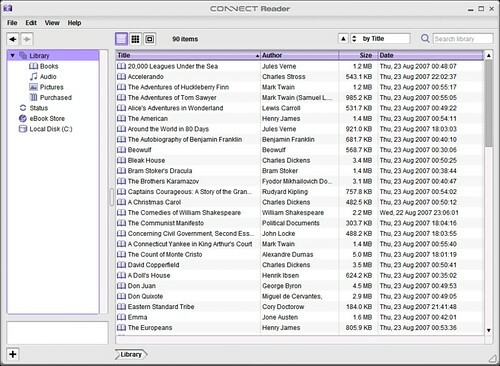 Connect Reader serves the same purpose that iTunes does for the iPod – it helps you manage the books on your Reader, and it lets you buy eBooks from their store. That’s where the similarities end, because I would hate to give you the impression that Connect Reader worked remotely near as well as iTunes does. Let me give you a few examples. Firstly, everything is slow. Deleting a book takes five seconds. Adding a book might take a dozen seconds. Connecting the Reader takes time. Using the Connect Store frequently involves waits of ten seconds. This doesn’t sound that bad until you begin adding and deleting dozens of books. There are all sorts of baffling limitations. You can’t edit any of the information on books, like correcting an author’s name or adding a genre. There is no ‘Synchronise’ option like there is on iTunes; yes, you can buy books and add them to your computer’s library while the Reader isn’t plugged in, but if you want to add them to the Reader, you’ll have to do them by hand – and the Connect Store won’t stop you from adding duplicates. You can only create ‘Collections’ (think ‘Playlists’) of books that are stored on the Reader itself, not on the SD card; if you plan on having more than fifty books, this will prove to be highly irritating. The one good thing about Connect Reader is that if you register your Reader and say that you live in the US (they don’t check), then you can buy 100 Connect Reader Classics for free. These are well-formatted editions of traditional, out-of-copyright classics, such as Dickens, Conan-Doyle, Shakespeare, Eliot, and so on. You can find all of these from other sites, but it’s a nice gesture. Unfortunately my good mood evaporated when I discovered that after clicking the ‘Buy’ button next to a book, I was taken to my shopping cart (after a few seconds). From there, I would have to click ‘Back’ to get back to the list of classics (again, after a few seconds). Try multiplying that by 100: the answer is ‘bloody annoying’. The Connect Reader software, and the Connect Reader Store, are pinnacles of poor design. They are slow, annoying and buggy. They would almost be deal-breakers apart from the fact that you don’t tend to buy or shuffle around as many books as you do songs; but I dread every single time I have to use Connect Reader. This is an real shame, because the hardware is pretty solid. Contrary to what I said earlier, you can use the Sony Reader on Macs. An enterprising programmer has written unsupported software (libprs500) that will allow you to manage your books on the Reader not only on Macs, but on Linux and Windows (if you want to ditch Connect Reader). Rather predictably, it’s a bit buggy, but in some respects libprs500 is actually better than Connect Reader: it’s faster and it has more useful features, such as the ability to convert all sorts of text formats into eBook. One new feature is, quite simply, the killer-app for me – the application that makes it better than everything that’s come before, that makes the Reader worth buying. This feature will download the entire contents of the BBC News website, Newsweek and the New York Times, format them with a table of contents and links, and then add them as books to your Reader. It does this in a few minutes, and requires only a single click. It works perfectly well, and means that instead of reading brain-rotting freesheets like the London Metro, I can read the New York Times on the tube. Try telling me that’s not cool. As usual, I have to add all sorts of caveats. You obviously lose some formatting, all the images and all of the layout. Even at an A4 size, the Economist displays about five to ten times as many words per page as the Reader. But you have to pay for the Economist, and you don’t have to pay for the New York Times. It’s slightly amusing that I’ll probably spend more time reading newspapers on the Reader than books, the content it was designed for. You can use the Reader in landscape mode, although this usually increases the text size to the point where it’s not really worth the bother. It does look nice, for about ten seconds, and then you get bored. The software is also fairly decent. A straightforward menu appears when you turn the Reader on. It’s a little slow to move between menus, partly due to the slow refresh speed of the display, but I don’t have any major complaints. Navigating the 103 books doesn’t take long, and there are all sorts of helpful features like bookmarking and the fact that the Reader will remember where you stopped reading for every book. Those features make up for the annoying wait that occurs whenever you open a book for the first time. One serious oversight in the Reader software is the way it orders books by author. Authors don’t have a ‘last name’ field, so they are usually ordered by their first names – unless the last name has been deliberately put at the first (e.g. ‘Dickens, Charles). Unfortunately different eBook stores have different practices, which ends up rendering the ‘Sort By Author’ option useless. Although the Reader is smaller than most paperbacks, it’s significantly heavier, at 330g. 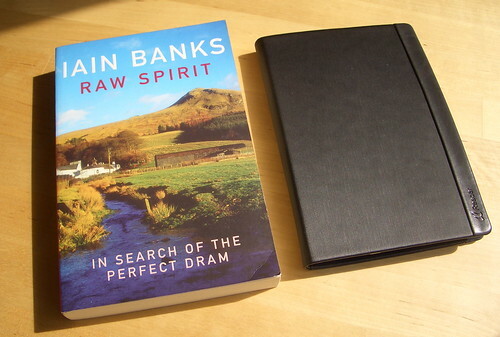 That’s about 25% heavier than Mr. Bank’s 330 page book ‘Raw Spirit’. This means that it feels surprisingly dense, and holding it comfortable takes a little getting used to; with only one ‘page’, it feels a bit small to be holding with both hands, but holding it in just one hand feels odd at first. I got used to it in a few days though. The design of the Reader is uneven. It’s not clear to me why they bothered putting in two sets of page-turning buttons, nor why the little joystick on the right doesn’t turn pages. I’ve found that holding it as in the photo above is the most comfortable posture (my thumb is over one set of the page-turning buttons), which is good enough, but the button placement and selection seems ill-thought out. The Reader has an SD card expansion slot. It’s possible to add and remove books on the SD card without invoking the dreaded Connect Reader, by simply copying eBook files back and forth. 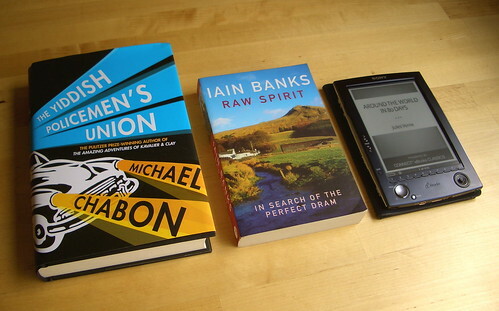 A 2GB SD card costs about £10 and will hold well over 1000 books, which I would imagine is more than enough for most. The only problem is that the more books you have on the SD card, the longer the Reader takes to load. It’s a bit of a mess, really. The software is terrible, the store is unpleasant to use and restricted to the US, the design is decidedly average and at $350, it’s not worth it. But after you’ve struggled through Connect Reader or switched over to third-party software, and after you’ve spent hours figuring out how it all works and loaded it up with books and newspapers, it’s really quite pleasant to use. Being able to carry around 100 books in your bag and jumping to your favourite passages is something that’s not been possible until now. It’s also tough to beat the feeling of reading your favourite newspaper on a crowded tube carriage, without having to fumble with the pages or find a bin to put it in. The problem is, it takes hours to figure it out. Who’s going to bother doing that? I’m an early adopter, someone who’s used to messing about with first-generation technology, and even I found it incredibly irritating to use. Most people will be stuck with Connect Reader. 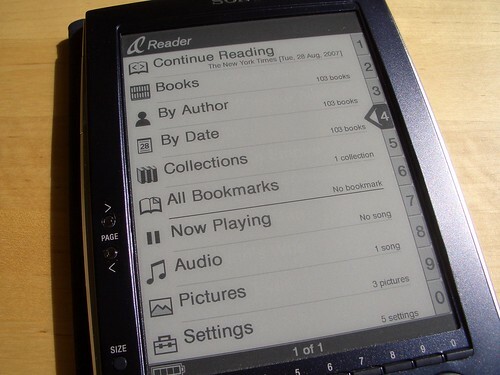 Unbelievably, it’s not the hardware that’s holding the Sony Reader and other eBook readers back, it’s the software. I was on the tube today, reading an article on the way to a meeting, when the guy sitting opposite me asked me about the Reader. This is a shocking occurrence – people hardly ever talk to stranger on the tube, and I can only put it down to extreme curiosity and the fact that he was a foreigner. In any case, he said that he was thinking about getting one for his mother, and wanted to know if you could change the size of the text. You could, I said, demonstrating. He nodded, and I showed him a few pages from the book. Finally he asked me how much it cost and whether he should buy it. I hesitated, and said that I wouldn’t have bought the Sony Reader for the full price. Instead, I recommended that he wait until next year when the second-generation of eBook readers become widely available. I was disappointed that I had to say this, but it’s the truth. 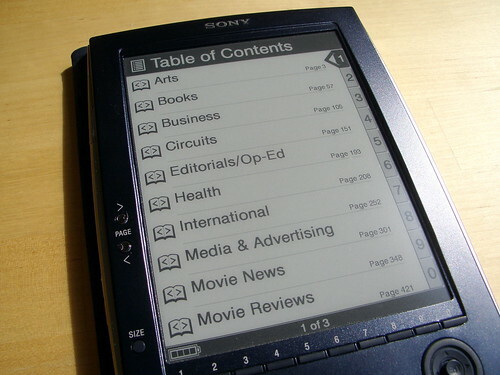 The Sony Reader just isn’t ready for the mass-market. But the fact that this stranger wanted to buy one for his mother shows that the mass-market is certainly ready for eBooks. 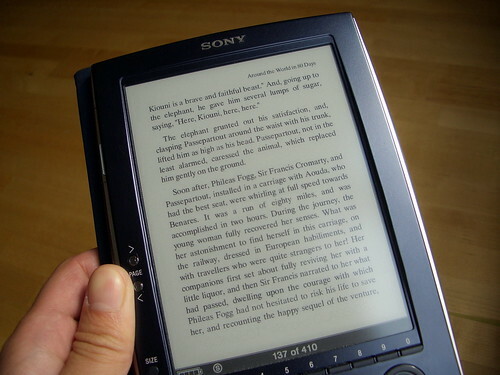 * What follows is a rather embarrassing and instructive tale of my first few hours with the Sony Reader. 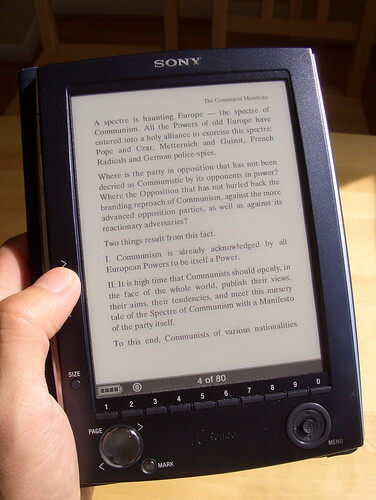 Like many other early adopters, I had researched the Sony Reader quite extensively and had found all sorts of third-party applications and books to put on it. After I had messed about with it an hour, I decided I should upgrade the Sony Reader’s firmware. This was an official upgrade, and it required Windows. Being a geek, I have a Mac. Being even more of a geek, I have software that lets me run Windows within OS X. I proceeded to launch Windows, congratulating myself on my craftiness, and plug in the Reader for the firmware upgrade. About a minute in, it stalled. I took the USB plug out and then put it in again. No response – the Reader insisted that it was still ‘installing firmware’. I tried a soft reset, which only brought me back to the same stalled screen. A hard reset didn’t even work. I tried every single recovery technique I could find on the web, and nothing worked. Having only received the Reader a few hours earlier, I was left with a non-functioning brick. Like I said, it was embarrassing. Now, throughout all of this, I had assumed that it had stalled because I’d done something wrong, like unplugging it while it was transferring books over on the Mac. But after discovering a forum post about the Reader, I realised it might have nothing to do with that. When you upgrade the firmware of a device, you are ‘reflashing’ the chip. It doesn’t really matter what ‘reflashing’ means, but the process of reflashing something over a USB cable is very sensitive to timing delays; sometimes a faulty USB cable will cause these delays. I knew that my cable was fine, but perhaps there was something else causing timing delays. That something else was my computer itself – by running Windows within OS X, as a virtual operating system, all of the USB instructions were being subtly delayed. This hadn’t caused any problems with any other USB devices I’d used before, but it just wasn’t good enough for the Reader. I booted into Windows fully (you can do that on Macs as well), plugged it in, and all was well. The moral of the story is, don’t be a smartass – no-one likes it, especially not finicky electronics. How often do you find yourself doing this?Does being able to carry so many books change how you read at all? As someone that generally carries a single paperback around (2 or 3 for a long journey), I’d struggle to find a reason for storing 100, or even more than 10 – either 98 of them would remain unopened, or I’d bounce from book to book and spend more time deciding what to read than actually reading anything. Hi Scribe – I think this is a little like the whole ‘why do you need to carry around your entire music library with you?’ It’s not exactly the same, because you can’t read 20 books in an hour, but it’s just a question of choice. If I *can* carry around 100 books, I can choose to read any of them. I might just read the same book nine times out of ten, but on that tenth time, I’ll be really grateful to have the choice to read other stuff. Sometimes I find it quite difficult to decide which of two or three books I should take with me on the train or plane, so with the Reader, I can really save some space. Realistically, I think that in the future, it won’t be about carrying around 100 books – it’ll be about having access, via wireless internet, to all book and all text, which is obviously something very desirable. Not too far in the future Adrian… We’re already beta testing a software on the iLiad that give access to all of the books available on Feedbooks via wifi. Sounds perfect – I’m looking forward to seeing it! Thanks for the fresh perspective. 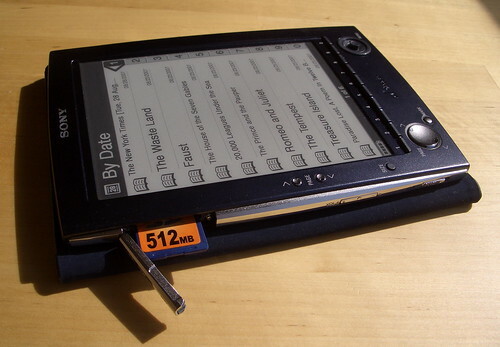 It’s nice to hear an opinion from someone who doesn’t reject eReaders offhand because they’re not tablet PCs or PDAs. Unfortunately, it’s a great idea with a lousy implementation. I’ve got the money for one just sitting there (and earning interest), waiting for an even slightly better model to come out. I have high hopes for the next revision, with the new screen, but I have to have RSS support. And no, pre-selected feeds don’t cut it. I have the feeling that Sony doesn’t think much of this product line outside of Asia. There’s a few options coming out soon; hopefully one of them will fit the bill. John: I read RSS feeds everyday on my Sony-Reader, and not just pre-selected feeds. Slightly lighter, with the new Vizplex technology (faster refresh, better contrast), it’s also a UMS device (works like a hard drive, simply drag&drop the files). Adrian: you live in London right ? I might come in London around November or December, I could show you a few extra devices. Hadrien: I’ve been recommending people the CyBook as well. I’m sure there must be other eBook readers in the wings, but few have been properly announced. Yes, I’m in London – email me when you’ll be around. Would be very keen to see other devices! Wonderful review article Adrian. Thanks so much for it. 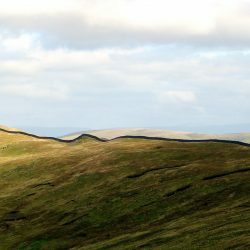 I’ve responded to some extent on my Editor’s Corner blog, essentially just quoting you at length! John makes a great specific point above about your reviewing the reader here as a reader, but I think the reason that this keeps coming up with regards to readers is that if you are going to be using a computer device to store your books on it, you want that device — simply because it is a hand-held computer thingymagig — to do more than just let you store books! The key point about the functionality of readers is that they ought to be readers first and foremost (of books, of PDFs, of magazines, etc), with additional features only coming later. The primary reason people will buy readers is because they want to read from them, and that needs to be made as easy as possible. That said, features like wireless and buying books directly *are* part of the reading experience. Listening to MP3s, which the Reader does, is entirely incidental. A good comparison is with the iPod. There are plenty of MP3 players out there that have more features, like recording, radios, song swapping, etc, but none can match the iPod for ease of simply browsing and listening to music. It’s only when the iPod mastered that did it branch out into games and video. The killer app you mention has me sold! How do you actually download the NY Times and BBC Website onto the Sony Reader? I got here from the above site which I visited by accident but by a total coincidence I had just discovered the existence of the Sony Reader today so was delighted to read the review. My main reasons for being interested in eBook readers is partly because I’m a commuter and like the idea of being able to choose what book I’m in the mood for on a particular day. But mainly because whenever I go on even a week’s holiday, I tend to bring around ten books with me and as I’m vaguely planning a lengthy trip around the world some time in the next few years, I found it impossible to imagine how I’d survive without a whole library! I think an e- book reader would be an excellent choice for travellers but it looks like Sony have a way to go to make it as useful as it could be. I’ll be waiting for a future model. The second page turning buttons are for the landscape view – very useful. In the landscape view your thumb is over the OTHER page turning buttons. The joystick does turn pages because it is used to switch from hyperlink to hyperlink. Vlad: OK, I can see the reason for the second set of page turning buttons, but I would say that the landscape mode is so rarely used that it’s superfluous. I would also argue that the joystick’s function is counter-intuitive. Everyone I have shown the Reader to thinks it ought to turn pages, not go back in history. I do find myself using it very occasionally, but because of the slow refresh speed, backtracking more than a few pages is just not a pleasant experience. 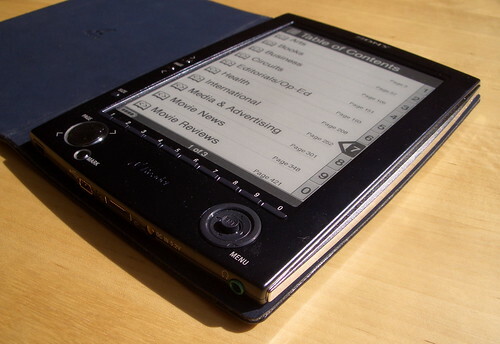 Ultimately, I think the design is at odds with the actual performance and functionality of the Reader. Maybe the joystick would make more sense if the Reader was a *lot* faster and the software was better, but it’s not. I enjoyed reading your review. I was particularly interested in your comments about CONNECT, specifically when you state that when you register they do not check as to whether you do actually reside in the USA. Hoewever, surely this becomes evident when you try to purchase a title as the billing info for your credit card will disclose the fact that you live elsewhere. Or am I missing something? You’re right – I wasn’t very precise in what I said. You don’t need to use a credit card to ‘buy’ the 100 free classics – it’s more like claiming them. So there isn’t any check that takes place. You mention upgrading the firmware. Where did you find the new firmware an flash utility? Perhaps it will fix some of the foibles! Hi, we have just bought my mum one of these having seen it advertised somewhere ages ago. We bought it in the States with not one person in the sony store telling us we couldn’t use the Connect book store. So, can we not use it here in the UK? I’m a little bit confused by where people are downloading their EBooks from – and if we find a PDF of a book we download can we access it on the Reader? (ie. what is all this DRM stuff?). Any help, much appreciated! Thanks. Like Natalie I bought my daughter a Sony reader in the USA last Christmas, she loved it until she discovered she cant buy ebooks here and as we do not have a US address we are kind of scuppered, I have read somewhere of someone in the US who will buy you vouchers from connect, does anyone have the name and should we go down that line? I have contacted Sony at various times throughout the year but they still have no idea if or when the reader will be available in th UK, We dont know how to do all these techie things to transfer files,and only bought it as we were running out of space for books, I have now been given an Irex Ilead and will probably swap my with daughter as she will be able to use it for other things at University but that leaves me with the Sony that I just want to down load books to read, HELP anyone! I’m interested in the Sony reader because I want to download typescripts (word and pdf) on a portable device rather than waste paper printing them out. Does anyone recommend the Sony reader for this, or are the Cybook or Ilead better? 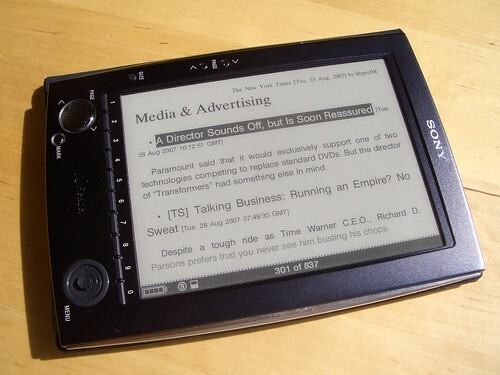 I would recommend either the new Sony Reader (PRS-505) or the CyBook. Both have a superior screen to the one reviewed here. Atleast epapers are making their way!! hooray! What I want to know, does the sony reader, allow the reading of intensive graphic heavy large pdf files? (upto 300mb per pdf) if it does, then this is a really innovative way to read textbooks! Great review, enjoyed reading it. How refreshing in a world of advertising and PR. I want a reader but will wait for improvements. Great review. Hugely informative. Many thanks for taking the trouble. Now in the UK, Sony is bringing out a Reader on 4th September 2008. It looks a little different from the one here. The page flip buttons are on the side as if you were thumbing the book. Is this next the generation or is this the roll out of the US version. Really useful and helpful overview. Pleased to see the tie-in to Waterstones over here, but a shame there seems no cost reduction in book price for a e-book despite reduced production costs. I’ve pre-ordered the Reader and hope I like it! Maybe, I’ll just wait till the tablet PC comes down in price. And while a Reader that with a A4 size screen might not be handy, it will sell – it will certainly sell. Anyone know what the new one’s like yet? It all sounds very interesting but does one HAVE to use the software provided by Sony? Interesting comments and I share many of them (the instructions – for the ordinary mortal – are utterly inadequate), though just putting on a book and reading it works well. But … never mind everything else, so far virtually nothing is available for it (I have found and bought one book and have another in mind) – I have checked about 20/30 more and they are not available. Watrestones site is described as adding more an enabling a search for etitles after Christmas! Really – get a move on publishing industry, I want to use the thing. Question from a Luddite next, but it is sort of important. Is the Reader capable of reading text documents, such as Windows Wordpad or Notepad? I have a lot of documents from various web based sources, and to have a device like this that means not having to power up a laptop every time to read them would be very helpful! Most reviews I’ve come across don’t mention is this is possible, or there’s a very obligue throwaway line that doesn’t clarify. Great review. Right on about the S/W issues. eBook Library, aka Sony Connect is a truly miserable piece of software. But to be fair to Sony, it must be a cultural issue. iTunes is how old? And they still can’t copy the key concepts. That said, I’ve worked for top Japanese Electronics firms in the past: great, if not brilliant, hardware design. But my 9-year old niece can design better software in her sleep. UI/UX is about talking to Users. Japanese firms do not do that and that is exactly why they create cr*p like Sony Connect. Yes, they should be embarrassed as the paradigm has already been invented. Just copy iTunes, oh yes, and release a version on Mac. Even Sir Steve woke up to the need to support both major platforms. It really makes me wonder in what kind of bubble the Sony Management/Sales live. They developed PRS in what 2007 and completely gave the idea, design and platform over to Amazon. What a bunch of under achievers! As Homer Simpson would say: “Doh!”. And I’d be happy to argue my previous opinion with Sony anytime. Walkman? Awesome! PSP? Kinda OK. PRS? Great IT, hopeless software. Professional Audio? Er, SSL (and ProTools and Logic) own the space and you were doing what with Oxford Digital? Why are you still employed as managers of Sony Electronics? Have you even been in a studio for mix-down of CD or DSS? Same problem in Broadcast Audio. Abso no clue. Which I guess is why we have been blessed with Sony Connect and the PRS 700. Talk about clutching defeat from the jaws of victory. Good thing for SNE they have MJ.